This double pedestal credenza desk is made of hard wood and veneers, for a sturdy construction and long life in your traditional home office. The secondary work surface features spacious storage drawers, with three drawers in both the right and left pedestals. Finished in a rich two tone wood finish, with clean lines and classic molding, this elegant kneehole credenza will be the perfect addition to your home office. Add the matching hutch for additional storage space. 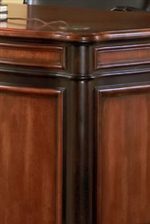 The Pergola Double Pedestal Kneehole Credenza Desk by Coaster at Carolina Direct in the Greenville, Spartanburg, Anderson, Upstate, Simpsonville, Clemson, SC area. Product availability may vary. Contact us for the most current availability on this product. 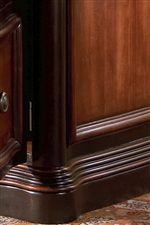 800500B2 Credenza Box 2 1 0" 0" 0"
800500B1 Credenza Box 1 1 0" 0" 0"
Finish & Paint Options Beautiful warm two tone wood finish. Handles & Hardware Simple aged metal hardware. Case Detail Molded shaped edges, classic molding, clean lines. Drawer / Shelf Construction Dovetail drawer construction with blocked corners for added durability. Wire Management Power strip on desk and credenza. Description: Top Smooth wood veneer tops with molded edges. Case Construction Crafted from select veneers and hardwood solids. The Pergola collection has a grand traditional style that is sure to make a bold statement in any home office. Crafted from selected veneers and hardwood solids, these durable pieces will offer sturdy and long lasting function in your home. Spacious storage drawers are dovetailed and corner blocked for added durability, with the addition of great features such as felt lining in top drawers, and locking file drawers for your peace of mind.Ball bearing glides make for easy drawer use, while powerstrip and drop front keyboard drawers offer simple computer use. Clean lines, classic molding, and a warm two tone wood finish give these pieces a timeless look that will complement any decor. Add the beautiful pergola collection to your home office for a fresh look and warm style. The Pergola collection is a great option if you are looking for Traditional furniture in the Greenville, Spartanburg, Anderson, Upstate, Simpsonville, Clemson, SC area. Browse other items in the Pergola collection from Carolina Direct in the Greenville, Spartanburg, Anderson, Upstate, Simpsonville, Clemson, SC area.